The trips over the last two summers took place primarily under sail, with the small electric outboard for “just in case.” The goal was to use the motor less and less, and that pretty much worked out. It was a real education about the realities of motorless sailing. 1. (This is obvious) It can take a long time to get somewhere. 2. It’s important to really not turn the motor on. There are many situations where you can clearly see that it’s possible to arrive without the motor, but it will take longer. By not starting the motor, regardless, you have the opportunity to measure the day after day energy required to get there slower. Or after dark. Or tomorrow afternoon. This takes more energy than one might think – it’s doable, but the ongoing grind can wear a person down. 3. It’s really satisfying to move around the planet with no motor. This is particularly true when distance walking is not an option. 4. The one solar panel keeps up with all the electrical needs of the boat just fine, if it is not asked to also keep up with recharging the motor more than once every week or two. If the motor were to be used more, the boat would need a second solar panel. Or more time at a dock. 6. Going around the outside of Cape Cod southbound/westbound is not so easy, and more risky, and I didn’t do it. Problems are that an ideal wind for entering Nantucket sound could, if things went badly, push the boat onto the lee shore of Cape Cod (littered with previous shipwrecks); after entering Nantucket sound there is still a substantial distance, filled with fussy navigation, before reaching a harbor where it’s possible to rest; the alternative, going south around the outside of Nantucket, means going far enough south to round Nantucket Shoals – you and all the shipping traffic. 7. Going through the Cape Cod canal southbound/westbound is also not easy with a minimal motor; if they close the railroad bridge at the west end, with the westbound current running, a minimal electric motor and appropriate batteries will not hold the boat against that heavy current for the 40 minutes required to wait for the train. Further considerations are that there is no anchoring allowed, and there are no back eddies in the irrigation ditch-straight riprap along the canal edges east of the bridge. Except for that one possible hollow just before the bridge – with the “do not cross this line when the bridge is down” sign, barring access to that spot just when you would need it. 8. Hooray for boat ramps on the coast, north of Cape Cod! 9. Motorless coastal cruising would be a lot easier with another person also on the boat. A LOT easier. 10. A yuloh makes it possible to refrain from the motor and still get to where you’re trying to go. Into tight harbors when the wind dies, or when the entrance channel is 20 feet wide and the breeze is blowing straight on the nose. Even against a little bit of current. 11. It’s possible to love the yuloh too much, forgetting that patience, and judgment, will get one there by wind power. This mindset can become almost like the desire/willingness to start the motor – hyper, rather than easy, making one “quick to jump.” Quick to unship the yuloh and start pressing. Missing the opportunity for a peaceful, ghosting ride into a quiet harbor, on that surprise puff of wind. 12. I still love the yuloh. 13. If there’s not enough wind to get out of a harbor without the motor or the yuloh, it’s probably better to stay put! I had a rule about that with the motor in 2012, after saying “I’ll just use the motor to get outside the narrow harbor entrance.” And then sitting for hours on the glassy water. I forgot this lesson once I had figured out the yuloh, and proceeded to get myself out of harbor, motorless, only to, again, sit for hours on the glassy water. I am so easily fooled by that half hour of breeze just after dawn! 14. Current is your friend, so long as you attend to the relationship. Know its habits, pay attention to the rhythm of its music, and for heavens sake, let it lead! This year, it was like a switch flipped. Suddenly I could see the swirls, the wild kaleidoscope of variation at the edge of the water. Back eddies that would carry the boat against the primary current’s direction, at least for a time. The shear line, moving gradually toward the shore, after the change of tide. I’d been looking, and looking, for this, with years of book learning. But it took shutting off the motor, and sailing through dying wind, over and over, before all of a sudden it blinked on – suddenly, I could see it, looking so obvious, as it had indeed been in front of me all along. For this alone, all these long, glassy hours of a perfectly good motor, tilted out of the water, have been worthwhile. 15. Know your limits. I’m not so good at this one (for better or worse) – I want to leave the motor in the garage. Jerome “Jay” Fitzgerald, guru of motorless sailing, goes on at some length in his various books, saying that a motorless sailor should have great physical strength. That strong, trained muscles are a crucial ingredient to safe motorless sailing. Of course, he also thinks that you need a yuloh with a handle made out of a 4 x 4 in order to move a boat. And this just hasn’t been the case aboard AUKLET. The more delicate yuloh suits my more delicate strength, and still the boat moves. However, there are limits, to both strength, and stamina. Perhaps the motor should stay on the boat, in deference to those limits. 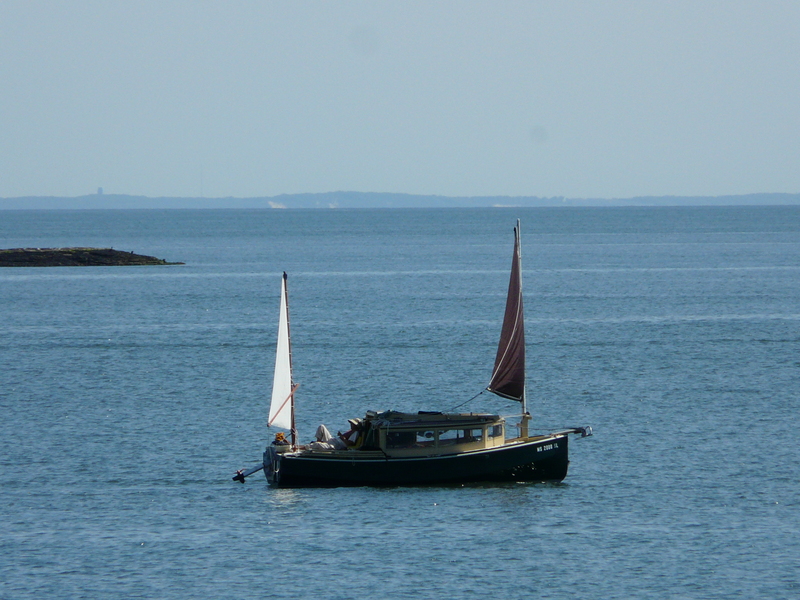 Or if the motor is off the boat, perhaps the boat should be in more sheltered waters. But that wild freedom, of being one with the unburdened Earth, is so wildly tempting. 16. If I would spend more time stopped, resting in one harbor or another, I might have the pep to do this well. I keep thinking that this is a function of health issues, this need for stopping and resting. But perfectly healthy sailors talk to me in person, or write in books, about the energy expended, and the need for rest, that comes of this activity. Motorless liveaboard sailors talk to me about spending a week – or two – in a nice location, before they are inclined to go out and sail again. Motorless sailing, because I want to do it so much, may be the one thing that finally teaches me how to really slow down. I know how to move slowly with the boat; what I need to learn is how to come to a full stop often enough, and for long enough, to have the energy to sail. Conclusion: Nobody ever said sailing was easy! But oh what a fascinating, rich, and generous opportunity it presents. Leaving the motor off simply expands the opportunity – by hundreds. My boys and I sailed around the outside of the Cape in 2012 in our motorless Core Sound 20, from Fairhaven. We left Chatham about dawn on the crucial day (no shelter til Provincetown), and proceeded to sail forward a few miles, then backwards (as current overcame dying wind) back past Chatham, then in building but still light wind forward again, finally dropping anchor behind Long Point at about 4am. –the minke whales were cool, though! That was one time I wished I’d had a motor! Other times include leaving Vineyard Haven for Woods Hole on the same dying wind you describe, and ending up miles east of my starting point! Wow – that’s quite an adventure in an open boat! How did you do with the current and the tide rips south of Monomoy? Or were you blessed with perfect timing for slack? I guess the Core Sound 20 is a pretty handy boat, but things were a little extreme when I went through there. And yes, riding the current forward, and back, and forward again is a funny process. My friends in Alaska anchor, even in extraordinarily deep water, when the tide turns, to wait for the next one. When we sailed together across Massachusetts Bay in 2012, Dave looked at the chart, and the 60 foot depths, and said “yeah, we anchor in this sort of depth.” Though I wasn’t tempted in the middle of Massachusetts Bay with all the traffic, besides which, we had wind. But the conversation made an impression on me – it’s a strategy that I had not really thought of for water that deep, but after all, it really is doable. They’re just used to it because they live where it gets really deep, really fast, so oftentimes if you’re going to anchor at all it’s going to be in those kind of depths. I’m thinking about carrying an anchor rigged especially for this task, that’s lighter weight, with lighter line and just a little bit of chain, so it’s all not so hard to get back but will do the job for deep water, and a midstream pitstop to wait for the wind or the current change without losing all that territory! Wonderful that the whales came to visit. How far off the shore did you stay, on the outside? When I went to respond to your comment, something I clicked on took me to your blog! Would you like to post a link, especially if you wrote up that trip? I’m sure that quite a few folks coming to read here would love to see it. I’ll bet your kids will never forget that one! for everybody – that link goes to a description of part of this trip that Jeff took around Cape Cod; other posts on his blog say more. There are lots of great pictures. So that answers a whole bunch of questions – I had assumed when you said Chatham that it meant Stage Harbor. Silly me! And cool that your Core Sound 20 has a cabin. What a nifty trip – thanks again for mentioning it. Yikes – and now I’ve read the page about starting across Cape Cod Bay. Glad it worked out okay – what a learning opportunity, huh? Thanks, Shemaya. If I thought you’d look it up, I’d have saved you the trouble and given you a link to that trip.